A telescopic forklift license is considered a crucial component for any industrial worker’s job profile. But it’s more than just a critical career booster; forklift telehandler training also ensures OSHA compliance for a variety of related tasks. Plus, telescopic forklift training is important for employers as well. OSHA mandates that all employers are responsible for training their employees. But since most companies don’t know how to handle this, there’s an easy and affordable solution: ForkliftCertification.com. FLC is the leader in telescopic forklift training and much more! Telehandler forklift training is important for any job candidate, and it’s also mandatory for any operator. Let’s look at the basic functions of a telescopic forklift, along with how to get a telescopic forklift license – and how it benefits both employers and employees. A telescopic forklift license from FLC includes a comprehensive review of all the key factors related to operating this type of machinery safely, efficiently, and effectively. With telescopic forklift training for your employees, you’re able to effectively and safely operate a whole new category of powered industrial trucks. As a result, your workplace is much safer and more productive. With FLC’s OSHA approved safety training, you can receive a telescopic forklift license that’s good for three years. And once your telescopic forklift training expires, you can easily take our renewal course to become certified again – it’s that easy! Get Your Telescopic Forklift License Today with Forklift Certification! FLC offers a trio of training packages to assist with your forklift telehandler training requirements. Each one covers telehandler forklift training, basic powered industrial truck safety, proper operating techniques and much more. Don’t take chances with your telehandler forklift training or telescopic OSHA forklift safety. FLC has the training you need, all with a convenience factor that’s hard to beat – not to mention, affordable prices to fit any budget! From small companies to large firms, FLC has the telescopic forklift training you need for your entire forklift fleet! • Train a Trainer – this course includes forklift telehandler training techniques, along with exclusive info to help anyone become their company’s main OSHA training resource! 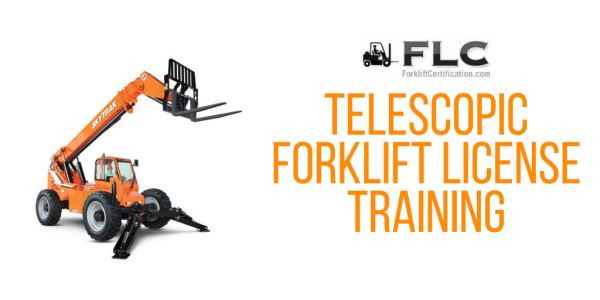 • Training Kit – basic telehandler forklift training, advanced safety methods and everything in between is included with the FLC Training Kit. We also review telescopic forklift license requirements. • Bundle Package – can’t decide between the previous two training courses? Get the best of both worlds with the value-added Bundle Package, specially priced for supervisors, safety coordinators and more. Get started today with any FLC training module. If you need to get your telescopic forklift license or conduct a refresher on forklift telehandler training, we have you covered. If you have any questions, or would like to speak with our OSHA forklift training consultants, please call Forklift Certification at (888) 278-8896. Thanks for considering FLC for your telescopic forklift training needs!